The Open Allergy Journal is an Open Access online journal, that rapidly publishes research articles, reviews, letters and guest edited single topics in all areas of clinical and experimental allergy including etiology, diagnosis and treatment of allergic and related diseases. 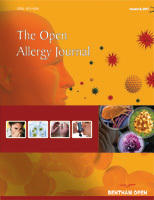 The journal’s coverage includes applied clinical allergy, allergic reactions, asthma, innate immune system reactions, clinical immunology, tissue remodeling, drug desensitization, atopic dermatitis immunopharmacology, natural history of allergic diseases and pharmacogenomics, and other important fields related to allergy. Methods of controlling allergic reactions by study of human and animal models are included. The Open Allergy Journal, a peer reviewed journal, is an important and reliable source of current information on important recent developments in the field of basic and applied allergy. The emphasis will be on publishing quality articles rapidly and making them freely available worldwide.